This year's event will take place at the Hilton Portland. Situated in the heart of the city, Hilton Portland offers a variety of inviting, contemporary accommodations and modern eateries. HopCity Tavern, the onsite gastropub, focuses its menu on locally produced fare by creating dishes that support 7 microbreweries and 16 farmers, creameries, butchers, and bakers from the area. Walk one block to the MAX Light Rail Station for easy access to the Portland Saturday Market, the Oregon Science & Industry Museum, the Portland Art Museum and so much more! At the Hilton Portland, we have negotiated a discounted conference room rate of $165/night + applicable taxes for attendees. Be sure to book prior to February 4, 2017 - the conference rate is not guaranteed after this date. The conference room rate includes premium in-room wifi and access to the newly renovated fitness center. The conference hotel block has sold out! If you haven't booked your room at Hilton Portland and need a reservation, local area options are listed below. Please note, you will need to book directly with these properties. We do not have official conference blocks at any properties listed below. 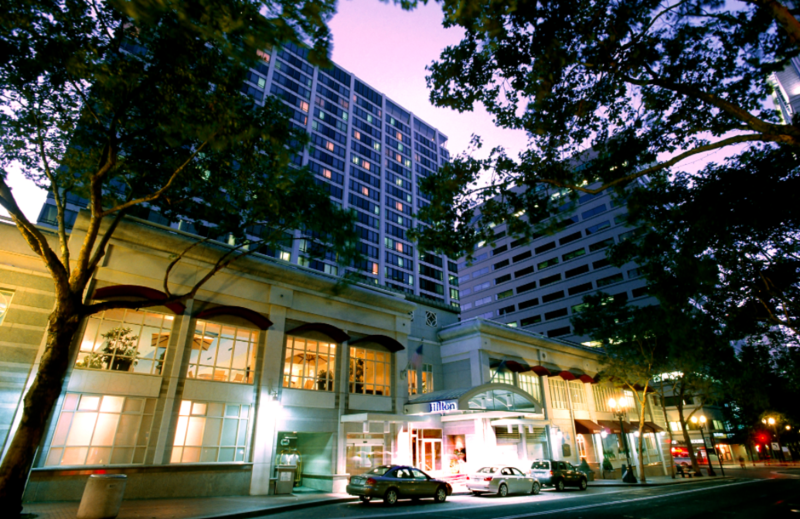 Take the MAX Light Rail from PDX to the Hilton Portland! Hop on the MAX Red Line and get off on the Mall/SW 5th Avenue stop. The hotel is a 5 minute walk from the light rail station. The trip takes about 45 minutes and is a bargain at $2.50 USD per one-way ticket! Valet parking is available for $43 USD/day. Unfortunately, onsite self parking is not available. The MAX Light Rail is the most efficient (and fun!) way to get around downtown Portland! Take the MAX Red Line from the airport to Hilton Portland for only $2.50 USD. For more information on stops and nearby attractions, visit the MAX Light Rail website. Looking for suggestions on fun things to do and explore in Portland? Interested in learning a bit more about the destination? Check back here for a list of our top five favorite things!